The First World War was an unprecedented catastrophe that shaped our modern world. In this war, one of the great medieval cathedral, Notre-Dame de Reims, which was the „rival” of Notre-Dame de Paris, burned. In mid-September 1914, it was still anyone’s guess who would win the Great War on the ground—but the Allies had already won the propaganda war, as far as public opinion in neutral countries was concerned, thanks to a series of German atrocities culminating in the burning of the great medieval cathedral of Notre-Dame de Reims. Built between 1211 and 1427 on the site of the baptism of Clovis, the first Christian King of the Franks, Notre-Dame de Reims was the church where French kings were crowned and is considered a crown jewel of Gothic architecture. Colossal and otherworldly, it is famous for its intricate façades, mystical stained glass windows, and elaborate statuary throughout, all imbued with historical and allegorical meaning. In 1862 it was added to the French government’s list of Monuments of National Importance, one of the world’s first efforts at systematic historical preservation. After war broke out, German troops briefly occupied the city of Reims from September 4 to 12, 1914, but were then forced to withdraw after the Allied victory on the Marne. They didn’t go far, however; the new front ran diagonally just a few miles northeast of the city, so the cathedral remained within range of the artillery of the German Third Army, now dug in near Vouziers. During the Battle of the Aisne, German officers supposedly told gunners to avoid shelling the cathedral on the presumption it was “off limits” to both sides, but then changed their mind when they saw French artillery spotters directing fire on to German positions from the roof—a charge the Allies denied. Whatever the truth was, on September 19 and 20, 1914, over two dozen German shells hit the cathedral (image above), setting fire to temporary wooden scaffolding, which in turn ignited oak wood in the cathedral’s roof. As the blaze spread, lead used to seal the roof melted and fell to the cathedral floor, setting fire to straw left there by Germans (who had used it as a hospital), followed by wooden pews, trim, and carvings. Shrapnel and collapsing structural elements shattered stained glass windows and destroyed pillars and statuary on both sides of the cathedral, decapitating the famous “smiling angel” of Reims. By an incredible stroke of luck, most of the cathedral’s priceless communion ware, vestments, paintings, tapestries and other treasures survived, giving the French authorities a chance to move them to safety. This wasn’t the end of the “martyrdom” of the cathedral of Reims, however: Over the course of the war, the structure was hit by 200 to 300 shells, including two more intensive bombardments in April 1917 and July 1918. By the end of the war, the cathedral’s walls and buttresses were still standing, but much of the rest of the building lay in ruins. 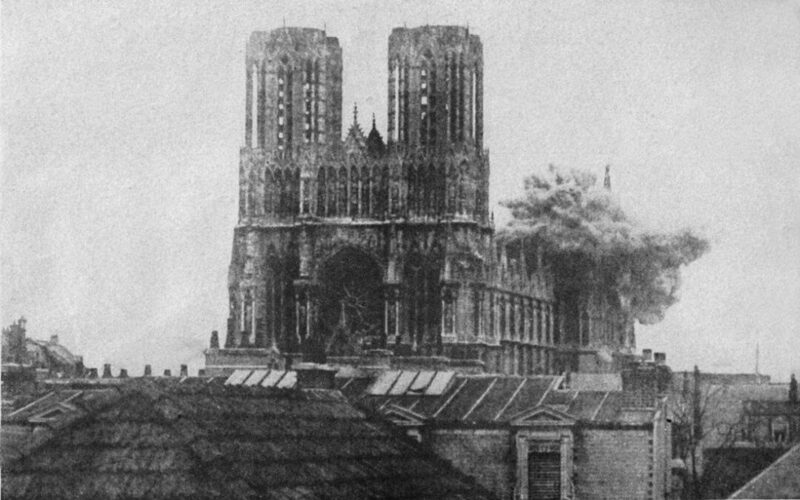 Tragic as it was, the burning of the cathedral of Reims was a gift to Allied propagandists who seized on it, like the destruction of the medieval library at Louvain, as a symbol of German “barbarism”—taking pains to note the disparity between Germany’s claims to be fighting for “Kultur” and its actual treatment of priceless cultural artifacts.